There’s something great about seeing social media being used to make real differences in people’s lives, beyond branding and business. If you’ve not been aware, there’s quite a disaster happening in Iowa as floods are destroying the established infrastructure, buildings, and peoples homes. 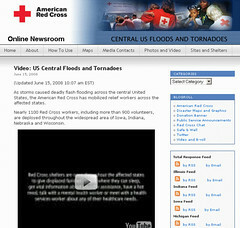 The Red Cross is using these fast-to-publish tools to get the word out, keep the community coordinated, and to raise funds for the rebuilding effort, which obviously hasn’t even started as the waters continue to threaten the area. They’ve created a blog for this specific disaster, which has pictures, blog posts, RSS feeds per each disaster area, alerts, and videos of relief works. Also they’ve a Redcross twitter account that gives updates, and interviews right from those impacted using Utterz (mobile audio), we can hear their first hand accounts rather through the words of a reporter often hundreds of miles away. This Iowafloods site, which isn’t related to Redcross but is aggregating media, voices, tweets, and pictures from the event, gives a solid look at the damage in the area. I’ve started to notice more and more non-profits starting to use these tools, they are inexpensive, reach people quickly, and spread rapidly. What’s really interesting is that many non-profits’ use of social media is than sophisticated than many Fortune 1000 companies, who often, have the same goals. If you feel touched by these people in need, you can always donate resources, clothes, food, volunteer, donate blood or money to your local chapter. Lastly, spreading the word from your own blog is yet another way to help, and it costs so little.